Belitung or Belitong, was better known as billiton is an island in off the east coast of Sumatra, Indonesia, flanked by the Gaspar Strait and Karimata Strait. The word Belitung is taken from the local language means sea slug. Belitung Island is divided into two districts, namely Billiton District, with Tanjung Pandan as the capital area; and East Belitung district, with Manggar as the capital. The island populations are mainly Malay ethnic, and they speak Belitung dialect; others are the Chinese Hokkien and Hakka. Most of the inhabitants, especially for those who living in coastal areas, must be very familiar with the rich marine products like fish. Marine wealth becomes a source of livelihoods in Belitung Island. The other natural resources that having the same important to Biliton people is tin. Tin mining has been started since the time of the Dutch East Indies. After arrive in Tanjung Pandan, we can immediately travel to exotic beaches in Belitung, such as Tanjung Kalayang or Tanjung Tinggi beach, which is approximately 1 hour drive. Besides, there are also others beach and island that close to each other like Tanjung Pendam, Burung Island and Lengkuas island. 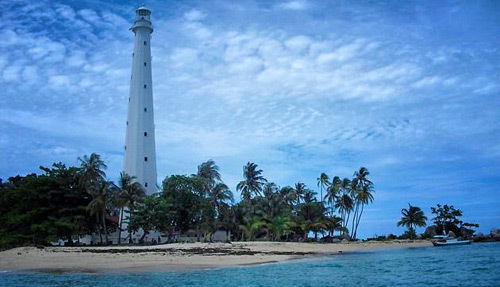 In Belitung, the mainly tourist destinations are beaches and islands/islets. The beaches are Tanjung Tinggi Beach and Tanjung Kelayang Beach which both have blue clear water, sand and rocky beaches. The islands/islets are Batu Berlayar Island which full of granite, Pasir Island which is made of sand (Sand = pasir in Indonesian language) and submerged during high tide, Bird Islet (Pulau Burong) which can be accessed from Tanjung Binga Beach by walking when low tide, Lengkuas Island which is a home of 129-year-old lighthouse and a good place for snorkeling, Babi Island and Kelayang.